For the past twelve months we’ve been busy preparing for this year’s StoryArts Festival Ipswich (SAFI). The biennial festival offers a full and diverse program for school students that promotes reading and story-telling. As well as being hugely honoured to be a part of this great event, it’s a lot of fun! The first step that we take is reading a mountain of children’s books to see what jumps out at us theatrically, and chatting to the festival director Jenny Stubbs, about what her vision for the festival is. What a joy it was to come across Michael Gerard Bauer’s books including Don’t Call Me Ishmael and The Running Man. His Eric Vale series (and its spin off Derek ‘Danger’ Dale series) is hilarious, fast-paced, action-packed with some wonderful characters and a complex protagonists that don’t patronize or talk down to children about its themes of identity, friendship, self-esteem, diversity and bullying. The humour and warmth of the books is brought out further with its witty illustrations by Joe Bauer (Michael’s son), who has collaborated with his father on the whole series. We’ve used Joe’s drawings as stimulus in the rehearsal room, and they’ve helped shape the world we’ve tried to create on stage as much as the story itself. Michael has been kind enough to share some Eric Vale insight with us, before ERIC VALE, EPIC FAIL is brought to life during the production's premiere at Studio 188 this September. Where did the idea of Eric Vale, Epic Fail come from? Strangely enough, the whole idea for the book came from me making a typing mistake. I was sending a text message to my daughter Meg who lives in Melbourne and telling her that something I tried to do ended up being a bit of a disaster. I meant to say something like, “Hey Meg, it ended up being an epic fail.” But what I’d really typed or what it was auto-corrected to was, “Hey Meg, it ended up being an eric fail.” I didn’t notice it, but Meg did (because she just loves to point out my mistakes!) and then she said, “That sounds like a character from one of your books. And that’s what started the whole thing in my mind. I began to think of a boy, not called Eric Fail, but whose name sounded like the expression ‘epic fail’. So I called him Eric Vale and I imagined him getting called Epic Fail as his nickname and then all these epic failures happening to him. Six books (three Eric Vales and three Derek Dales) have resulted from that simple typing mistake. I always say that stories are all around us and that they start usually from tiny things not big ideas. Discovering a story for me, is a bit like finding one piece of a jigsaw puzzle and then trying to work out what all the other pieces are that make up the final picture. Your son Joe does the illustrations for the books. What kind of process do the two of you have when working together? Working with my son is a joy, but it’s not really like the way Joe once illustrated it! (check out the illustrations of Derek 'Danger' Dale below to see his transformation) Most of the time we tend to work quite separately. I write the stories and then Joe does the illustrations. Luckily we have similar senses of humour. Sometimes I suggest illustration ideas to Joe and I’m also very happy for him to suggest things about the story/manuscript to me. Joe’s a great comedy writer. With his wife Rita (Artspear Entertainment) Joe has written, produced, acted in, directed, edited and created amazing special effects for two full length comedy feature films. They also do spoof movie trailers on YouTube under the name Toon Sandwich. Joe’s Jurassic World take-off trailer which is called Jurassic Whoops has had over 2 million views and is still climbing. Can you tell us about some of the other characters in the Eric Vale world and how they’ve evolved through the series? Well Derek appears in all the Eric books as a character that Eric himself has created and writes his action adventure stories about. 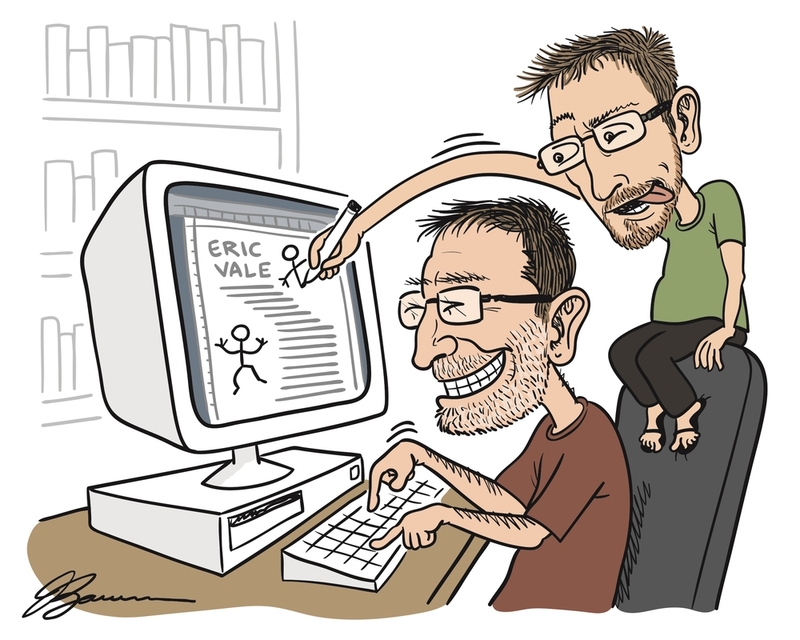 He’s Eric’s ultra-ego, someone who always manages (usually in the most bizarre and unexpected ways) to be the hero. One way he’s developed is that his adventures have become more over the top and also he seems to have put on more muscle as the stories have progressed! When Joe first drew Derek he wasn’t quite as impressive. (See attachment) Joe also decided early on that it would be a funny recurring joke if Derek never wore a shirt. That’s easy for the illustrator to do, but now I have to come up with ridiculous reasons why Derek’s always shirtless in different situations! The publishers ended up liking Derek so much that now he has three books all to himself. Meredith Murdoch appeared just a bit in Eric Vale Epic Fail but I really liked her particularly because of the way Joe drew her. So in the second book Eric Vale Super Male she plays a more starring role. At the beginning Eric finds her really annoying because she has strong views that often clash with his, but by the end of the story he sees her in a very different light. I like Meredith she’s smart, feisty and has a good heart. Joe's later illustrations of Secret Agent Derek 'Danger' Dale shows that he's certainly packed on some more muscle! What excites you about how Eric Vale has been received? I think in general the most memorable response to the Eric Vale series for Joe and me is how it’s been embraced by other countries. 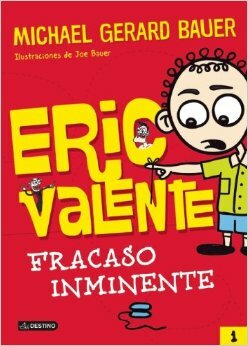 The Eric Vale books will soon be translated into five languages and sold in around 34 countries. We also like how Eric gets different names in the process like Eric Valente in Spanish, Alek Topa in Poland and Rupert Rau in Germany. What are you most looking forward to about the stage show? I’m really looking forward to seeing the characters come alive on stage and seeing some of those famous Eric Vale epic fails acted out by this terrific cast. The other thing I’m really excited about is the addition of music and songs to the story. The little peek I saw at an early rehearsal tells me that this production is going to be one big EPIC WIN! ERIC VALE EPIC FAIL will play from Monday 6 to Thursday 10 September as part of the 2015 StoryArts Festival Ipswich. There will be three public performances on Friday 11 September (6:45pm, followed by an artist Q & A) and Saturday 12 September (2pm & 6pm). Click here to find out more or here to buy your tickets.